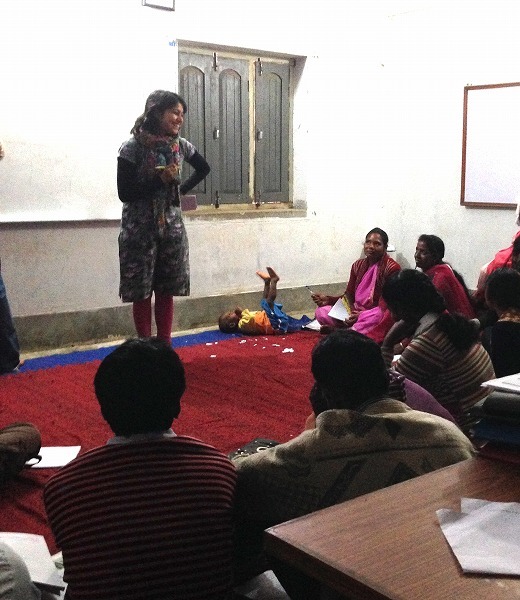 Earlier this year, I was giving social audit training to a group of women and men in Gumla district of Jharkhand when a toddler of a young mother (a trainee) decided to be cranky for her attention. She tried to humour him and feed him but to no avail. While this distracted her from the class, others too started glancing at her with impatience. Embarrassed and under the pressure of those accusing glances, she tried her best to console the child. Gradually, people sitting at the back started raising demands of either quietening the child or leaving the room. Some even whispered why come to a class with a child !?! Amongst that mixed din, a loud male voice stood out categorically asking the mother to take the child outside. Embarrassed, she started to rise, pick up the toddler when I intervened and asked her to sit again. My team members and I tried to distract the child and finally got him to play again with others… and so we continued the training after a gap of about 20 odd minutes. I feel this incident highlighted some significant social behaviour towards mothers coming to work and a brief insight into the gradual process as to how they are forced to leave the work force. The mother obviously did not have any help at home where she could have left the the child, nor a crèche at the centre for training (which was already in shambles!). Her concentration in the class was divided between her child and the discussions, though her participation and responses were quite good. Had she gone home that day with the child, she would have not completed that training, or gone on the field to conduct field interviews for social audits. Apart from the experience, it would have also deprived her from the honorarium she would have earned for her work. All because she is a mother with no day care help for her child. Another issue that I felt got raised was embarrassing a mother for bringing her child to work. She can’t leave him at home and if she does, it also means she stays back and automatically gets out of the workforce in due time. A man (amongst many others sitting there!) feels he has the authority and social sanction to tell a women, his fellow trainee nonetheless what she should do with her child. He does not feel an iota of shame or realises the kind of embarrassment he has caused to a mother. While gender sensitisation is the buzz word of this decade, how exactly does it translate in real life, in social and work scenarios? I say this because the training that all of them were undergoing at that moment included village survey on gender based indicators and specifying outcomes on how a certain welfare scheme has affected lifestyle and lives of women in the village amongst other things. Theoretically or verbally perhaps, the man who shouted across the room was in-sync with terms like women empowerment, participation, economic freedom etc, etc.. but clearly there was a disconnect. He was trying to learn this as a professional skill with no intention of understanding or assimilating it in his social life. He mentioned delay in time and class schedule with much more urgency, without grasping the practical compulsions of dealing with a young child. If no-one in the class interferes and even the trainer does not interfere, the mother would have picked up the child and gone home. Why this behaviour does not outrage others? How exactly we can enforce gender sensitisation in practice? Why we do not emphasise on the need for formal and compulsory child care for working mothers? Possibly this insensitivity and its many manifestations are the reasons, why educated or ambitious mothers have to stay at home! * This article was originally published on Lives Some Live. Author: Akansha YadavAkansha Yadav is State Programme Coordinator at Department of Rural Development, Government of Andhra Pradesh in India. She manages a popular website, Lives Some Live.